The Holy Princes Constantine and his sons Mikhail and Fyodor of Murom lived during the eleventh-twelfth centuries. The prince sent his son Mikhail as emissary to the Murom people, but the pagans murdered him. When Prince Constantine arrived in the city with his retinue after taking it by force, the people quieted down and accepted him, but for a long time they would not give up paganism. Once, they went to the prince’s home, intending to kill him, but the prince came out to the crowd holding the Murom-Ryazan Icon of the Mother of God. The mutinous people unexpectedly quieted down and agreed to accept Holy Baptism at the River Oka. At the place of the murder of his son Mikhail, Prince Constantine built a church in honor of the Annunciation, and later on another church named for the Holy Passion-Bearers Boris and Gleb. 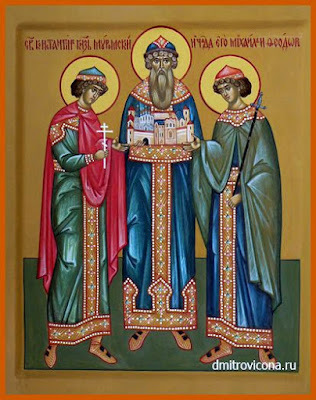 Prince Constantine zealously assisted his son, Prince Fyodor, in spreading the Christian faith among the people of Murom. Saint Constantine died in 1129, and was buried in the Church of the Annunciation beside his sons, Saints Mikhail and Fyodor. They were canonized at the Moscow Cathedral in 1547. Constantine's wife Irene is also venerated at Murom. A new cathedral was built on the site of the wooden Church of the Annunciation in 1553. It became a monastery under Ivan the Terrible and was ruined by the Poles during the Time of Troubles. In 1664 it was rebuilt by wealthy merchant and arts patron Tarasy Tsvetnov. 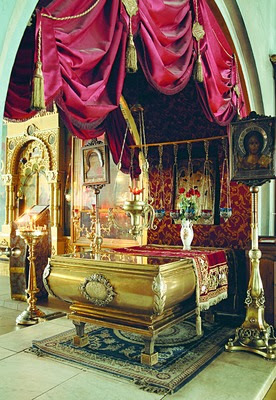 The monastery features the relics of Constantin and his sons Mikhail and Fyodor. 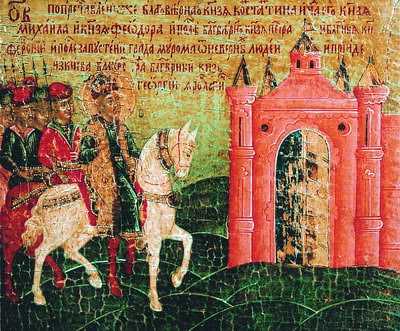 According to a legend recorded by local aristocrat and amateur historian Alexander Yepanchin, each midnight the monastery's gates disappear, and Constantine, Mikhail and Fyodor, clad in regal attire, ride out in a gilded carriage and head to the Cathedral of the Nativity of Mary, where they are met by Pyotr and Fevronia. After praying there, they guard and patrol the city. 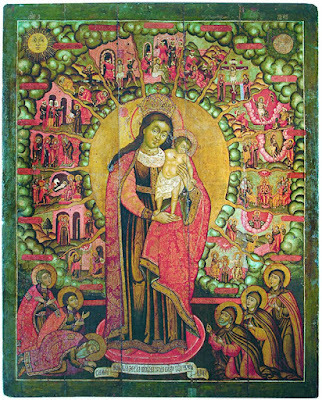 Icon of the Mother of God "The Star Most Bright"
The icon shows a full-length representation of the Mother of God with a star sending forth rays of light in the background. The origin of its name is connected with the poetic hymns in honor of the Most Holy Theotokos. Standing on her right hand is the Infant Jesus. 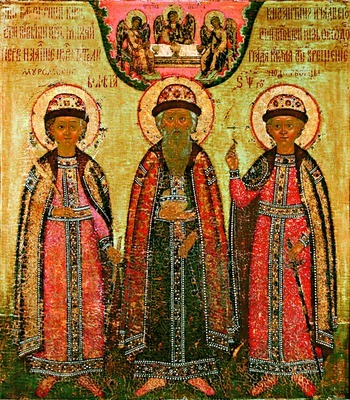 At her feet are Murom saints: Sts Constantine, Mikhail and Fyodor arrayed in princely robes and Sts Petr, Fevronia and Uliania clad in monastic habits. 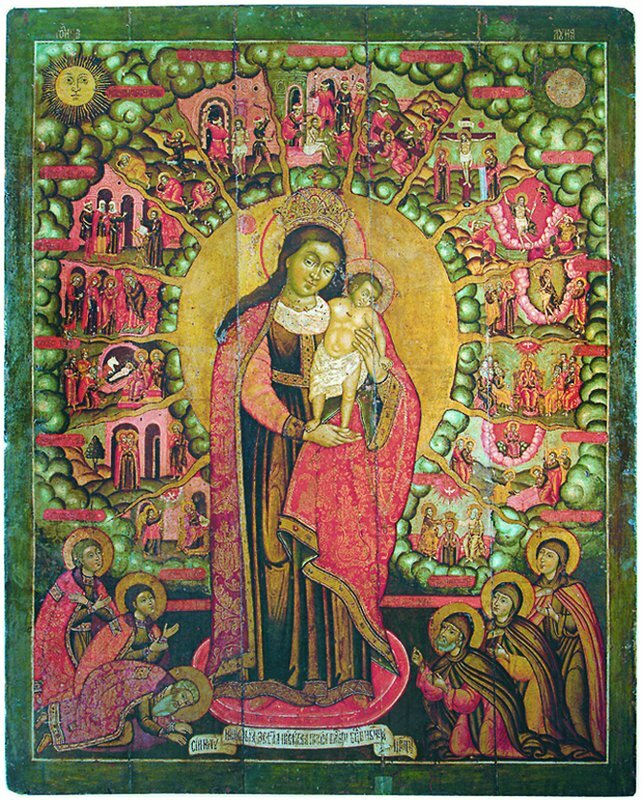 In the bottom part of the icon is the following inscription: 'This Marvelous Image is the Star Most Bright of the Most Holy Lady Mother of God Queen of Heaven."